The Kavanaugh confirmation process provided the otherwise preoccupied and busy nation a moment of clarity. 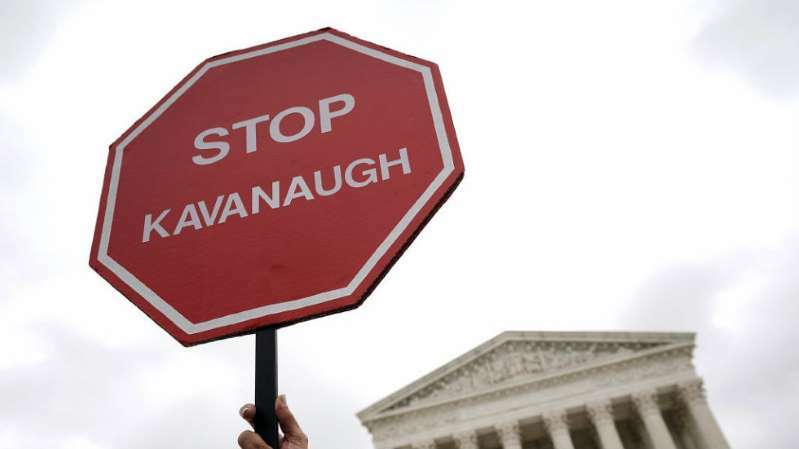 We all saw the angry mob on the streets, heard uncivil rhetoric on the airwaves, calls to "get in their faces" on social media, and witnessed the take-no-prisoners obstructionist gamesmanship on the Judiciary Committee, the smearing of Brett Kavanaugh and the exploitation of Christine Blasey Ford. The anarchistic ugliness contrasted sharply with the moderate Democratic Party brand carefully sustained and curated since the rise of Bill Clinton. After the wall-to-wall saturation coverage, the moderate Democratic Party brand was vaporized, and in its place was seared a new Democratic Party brand seething with anger, intolerant of differing opinion, furious at white men, and expedient in its tactics. Unlike 2016 and every day since, this wasn't about Trump and the visceral hatred on the left for that one man, except indirectly. If it was, it would be easier to ignore. This was about important things that transcend any one president: competing views for the shape of our society, and how the new Democratic Party intends to compete. Because of its absolute certitude in its moral superiority on matters of race, gender, abortion, #MeToo, income inequality, climate, immigration, and guns, this new version of the party has made clear it believes the ends justify the means. It will not respect the normative social contracts, such as elections must be respected even when your side loses, the winner has the right to make judicial appointments, set policy and execute it through the administrative state, and everyone is entitled to the presumption of innocence.All that is out the window. The new extreme Democratic Party regards the Constitution as an antiquated hindrance to achieving its political goals, to be totally altered, or cast aside entirely.Western Civilization is perceived as the well-spring of the oppressors, and the white male dominated Republican Party as the instrument of oppression. This rage fueled the mob in the streets and in the halls of Congress, bullying those who disagree. Nothing short of Kavanaugh's scalp, guilty or not, would suffice as rough justice. Whereas the Republican war on women was always a convenient fiction of identity politics, the nation saw and understood the new Democratic Party's war on white men is very real: they are now deemed indefensibly evil. Senator Cory Booker (D-N.Y.) said: "You are either complicit in the evil, or fighting against it. "Apparently, if you don't agree with him or aren't enabling him, i.e. not a part of his mob, you are complicit in evil. Never to be outdone, yesterday Hillary Clinton doubled down on her infamous and dehumanizing "deplorables" comment with this gem: "You cannot be civil with [Republicans]...if we are fortunate enough to win back the House and or the Senate, that's when civility can start again." Synthesized: Give us power, then we'll talk. Andrew Breitbart famously said, "Politics is downstream from culture." The culture that bred and raised the new extreme Democratic Party was created on elite college campuses, and now infects almost all of academia K-12 and higher education. Until a generation ago, the central organizing principle of higher education was "the pursuit of truth." Truth may be unattainable, but it was widely understood its pursuit through reading, civil discussion, exchange of ideas, exploration of one's own and opposing thought developed an understanding of one's own thinking and that of others, which fostered compassion and mutual respect. These are the sensibilities and skills necessary for moderation and for political compromise. However, the new central organizing principle on campuses across the country is what liberals call "social justice." The social sciences and humanities have been reduced to identifying the victims and the oppressors. The greater the victimhood, the greater the status of the victim and the greater the moral imperative. This is the root stock of identity politics, but it is not a preparation for responsible citizenship. It is indoctrination camp for intolerant liberals and would be revolutionaries. For the new activist Democratic Party, the bedrock foundations of our society embedded in our Constitution such as rule of law, free speech, due process and presumption of innocence have been reduced to opportunities, not imperatives. Tools to be used when expedient to accomplish objectives, and otherwise ignored. In stark contrast Senator Susan Collins (R-Maine) stepped to the microphone and offered a reasoned, compassionate, and utterly American analysis and conclusion. She embraced the objective of #MeToo, but reminded us how to think about these things and effect change in our form of government. It was a lesson in the Constitution, rule of law, traditional American values and reasoned judgment. In the aftermath of the Kavanaugh hearings, the few remaining moderate Democrats find themselves passengers in the backseat of a minority party that has swerved hard left, lost the ability to have civil discourse, vilifies half the country or more, and is incapable of compromise. The Kavanaugh hearings revealed that radicals have captured the Democratic flag. If the Democratic Party remains extreme, one unintended consequence is they remind the casual observer why it is so important to vote. If the Democrats fail to win the House or Senate in 2018, they will likely fail to win the presidency in 2020. Dan Palmer is a Republican donor and conservative political strategist. He served as executive director of United We Stand, planned the potential transition of Ted Cruz, and supported the campaigns of Kevin McCarthy and Donald Trump. You can find him on Facebook @RealDanPalmer.